The plan was to go flat out from first bin to Col du Diable before the snow got too heavy. 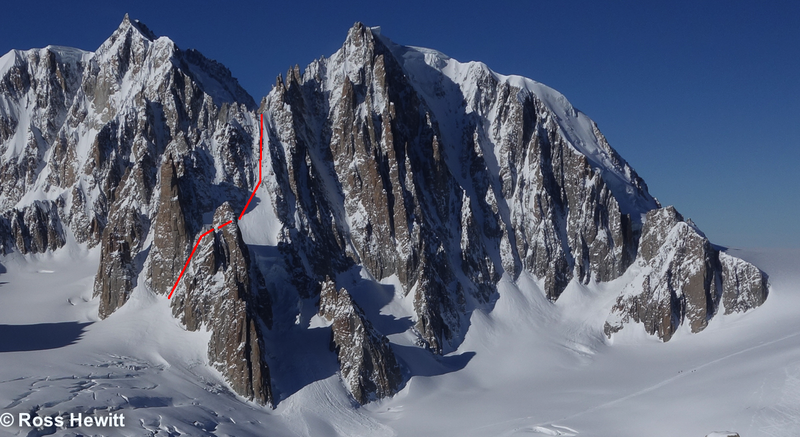 Fast progress was made round into Cirque Maudit and up the South facing access couloir next to the Grand Capucin onto the hanging serac. 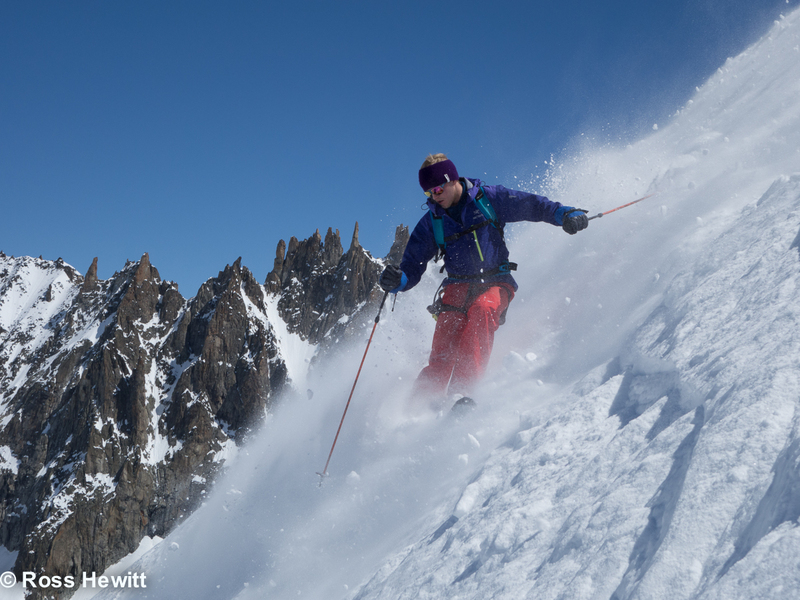 Above, the line blasts esthetically up the headwall to the ridge next to the Aiguilles Diables. 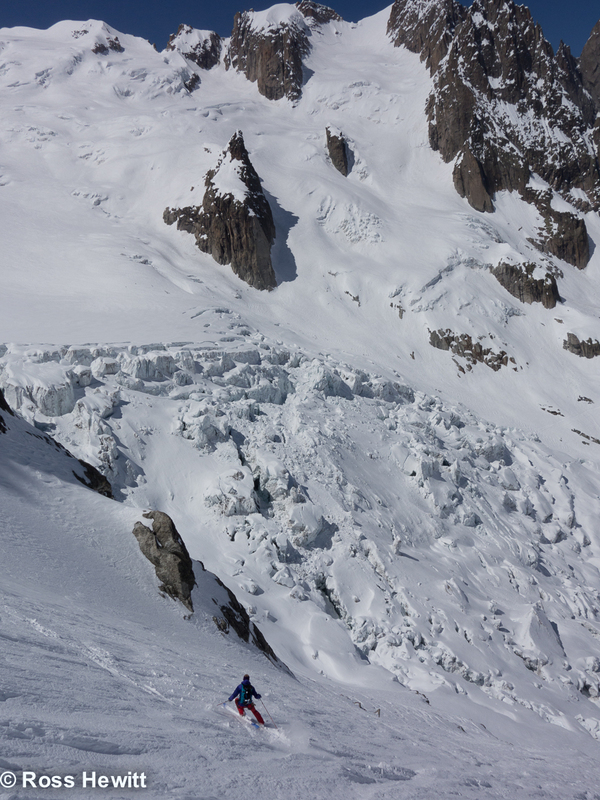 As we raced up the couloir the snow was deteriorating fast in the heat and we had no choice but to turn round at half height. 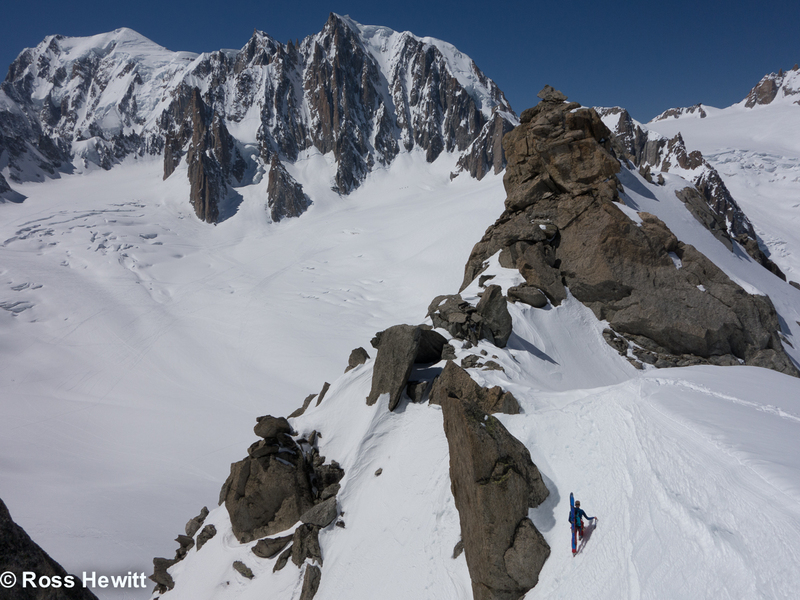 The shallow snow pack here peppered with rocks didn’t make for a flowing ski. 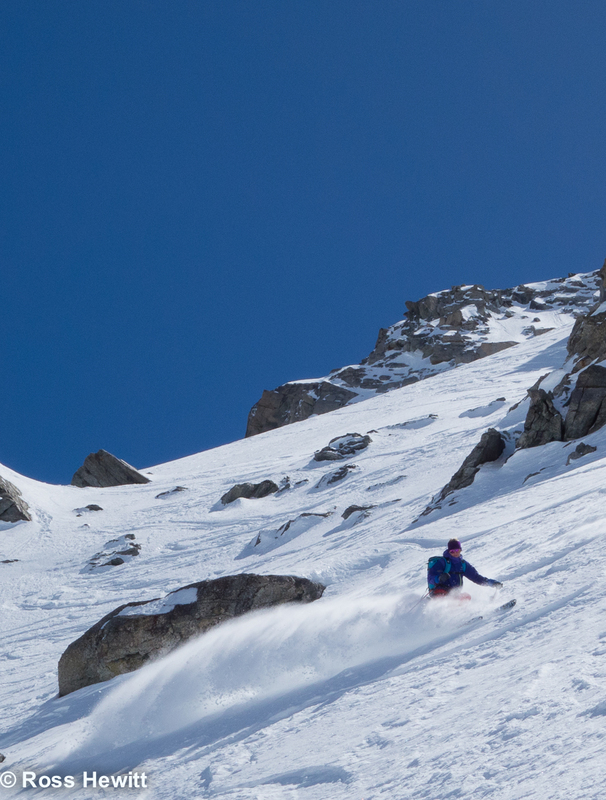 It will be good to ski in better conditions another time. 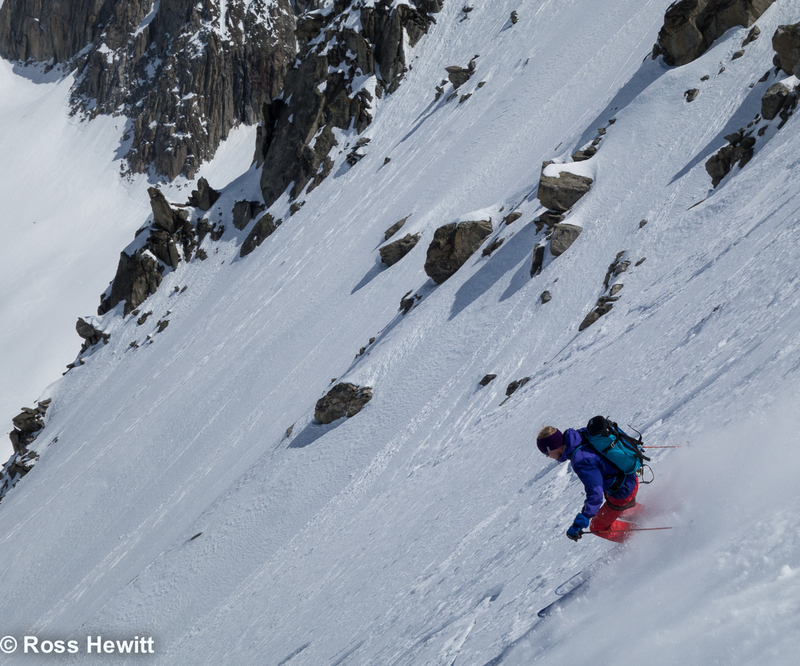 10 minutes later we were down to the Mont Maudit cirque and both still motivated to ski before the bad weather arrived the following day. 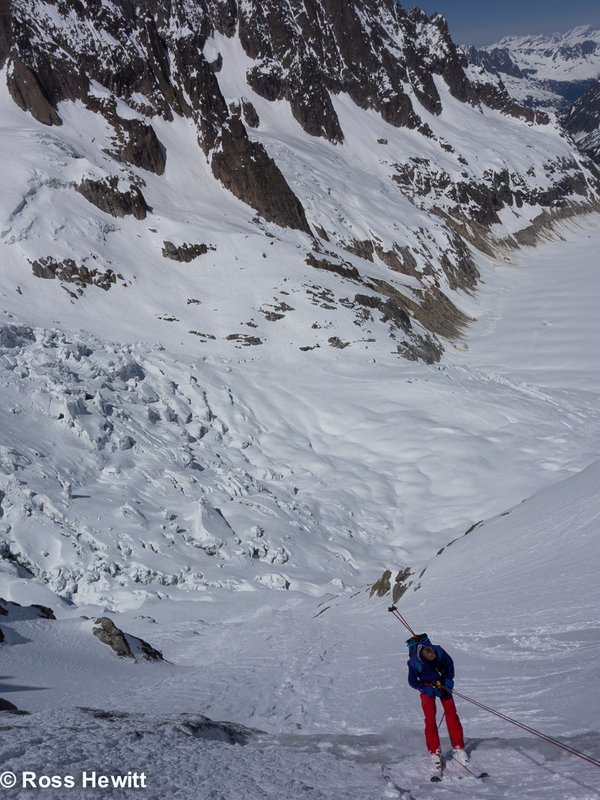 We headed off in the direction of the Noire above the Geant icefall and romped up the access couloir before it got too much sun. 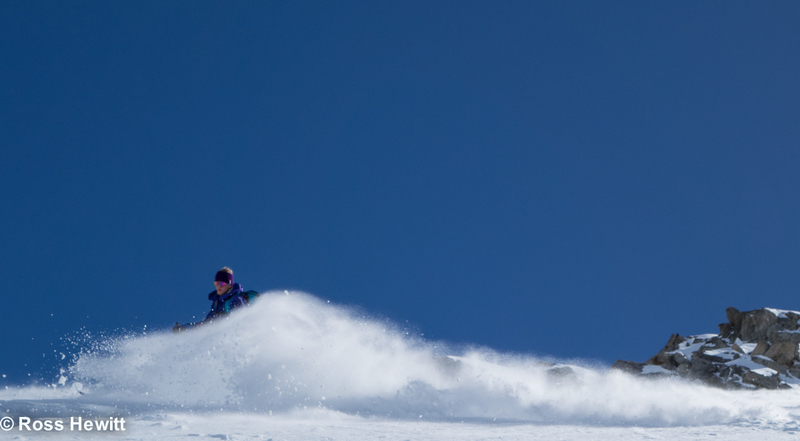 The summit ridge revealed acres of our preferred ski medium – coldsmoke. 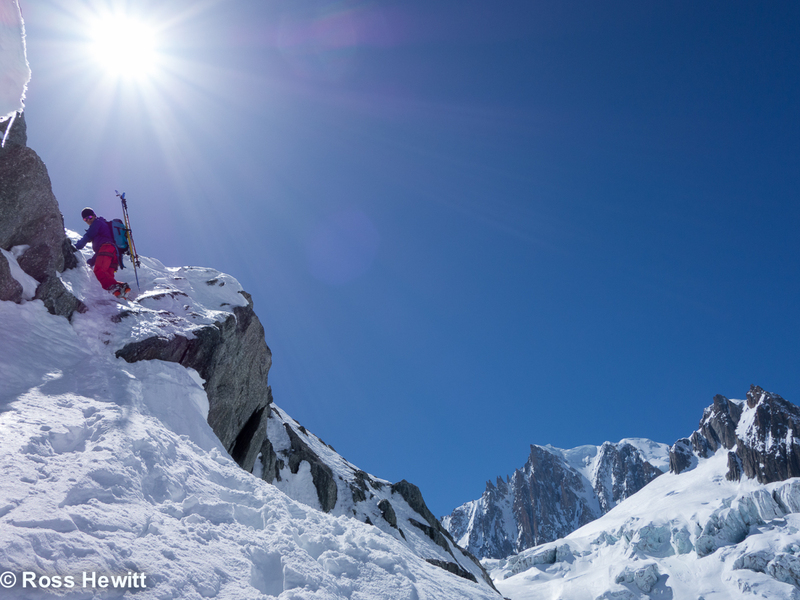 After running around for a few hours we enjoyed a couple of minutes on this high perch over the Mer de Glace while eating lunch before cruising on down the North Face. 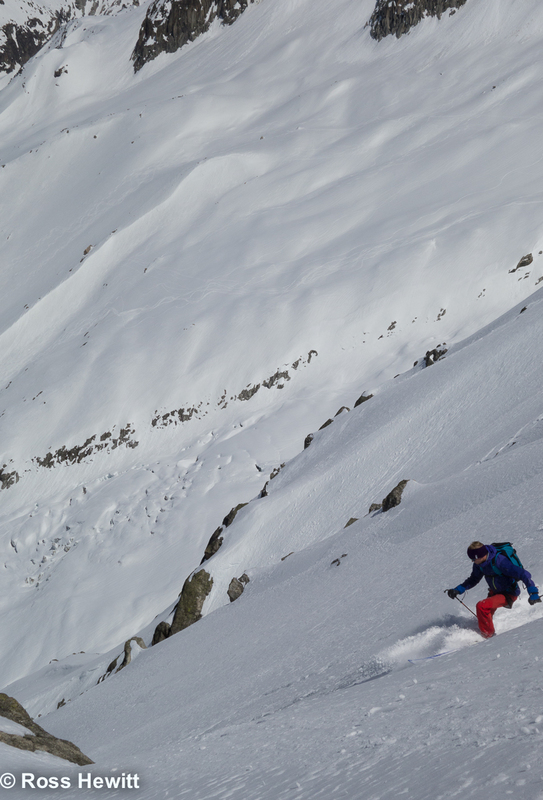 The skiing is never hard but it would be worth having a photo of this face on your phone as route finding could be problematic and rock slabs aren’t helpful for anchors. We managed to sketch over the first slab choke on skis, the snow was only 2-3 inches deep and after Dave passed I had some bare rock to edge over. 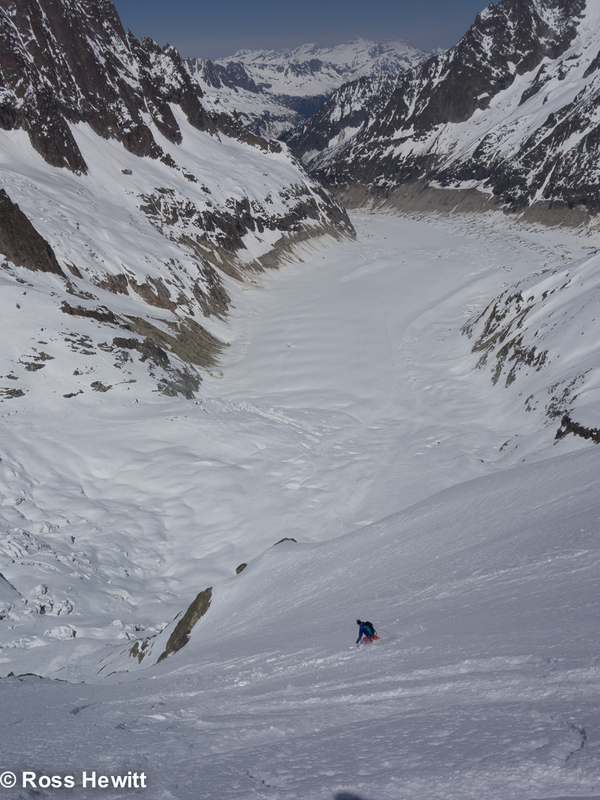 Then there is a 30 m rap over an icefall which we kept our skis on for. 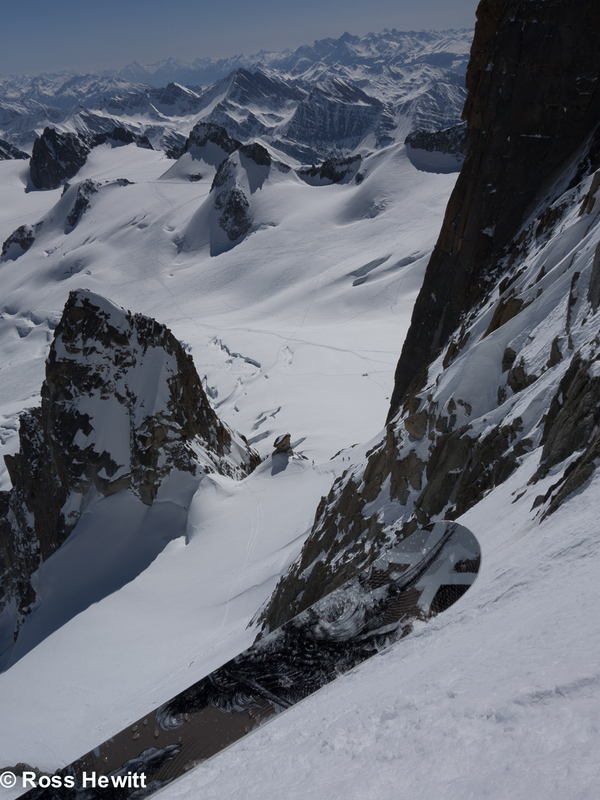 Long easy slopes led to the base of the face where an awkward little step to runnelled, crevassed, hard snow forced us to downclimb – no anchors in sight here. 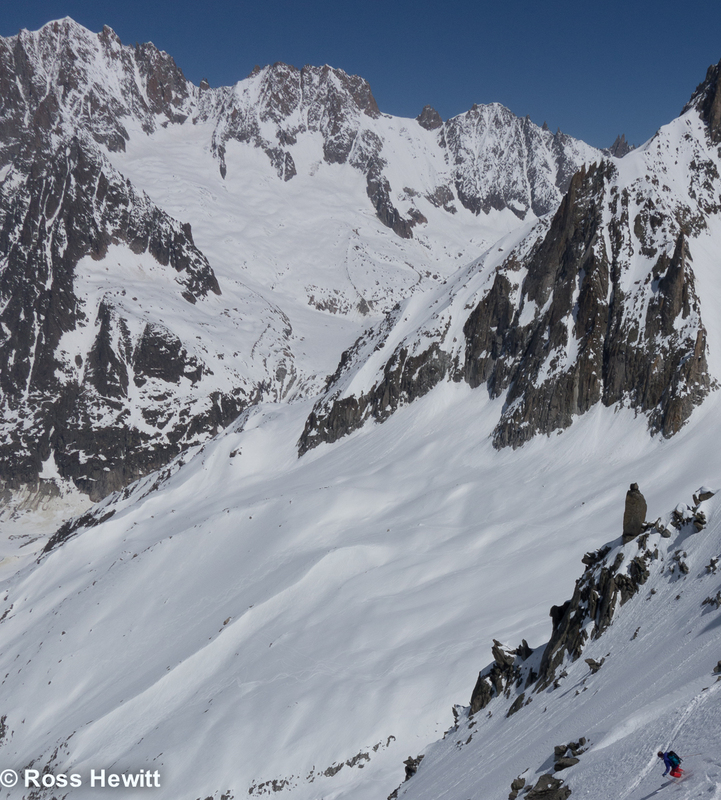 This entry was posted in Uncategorized and tagged Aiguille du Midi, スキー, パウダースノー, フリーライド, beau, Chamonix, Chamonix conditions, Chamonix Mont Blanc, Col du Diable, 粉, Dave Searle, вне трасс, катание на лыжах, порошок, esquí, esquí de montaña, 雪, Flegere, Freeride, Freeride Skiing, Gebirge, Gnarly, Macho Couloir, Michelle Blaydon, montañas, Montagne, Mountains, neige, neve, nieve, North Face of the Noire, снег, Offpiste, polvere, polvo, Poudreuse, Pow, Powder Skiing, Pulver, Pulverschnee, rad, Ross Hewitt, Schnee, scialpinismo, Skifahren, Skiing, Skitouren, snow, 关闭滑雪道, 山, 山スキー, 山地, 滑雪 by Ross Hewitt - Skiing, Climbing, Photography. Bookmark the permalink.